Preheat a tea pot with boiling water and then empty. Measure 6g of tea and place into the pot. Top with 440ml of water boiled to 80°C. Stir the tea well into the water and cover with a lid. Brew the tea for 2 – 3mins, stirring the leaves once again after 1.5 minutes (it should be a strong brew as it will be used as a cocktail base). After your brewing time, stir your leaves one final time. Strain the tea leaves and leave to cool at room temperature. Do not place your brewed Oolong in the fridge, as it needs to be a transparent colour. 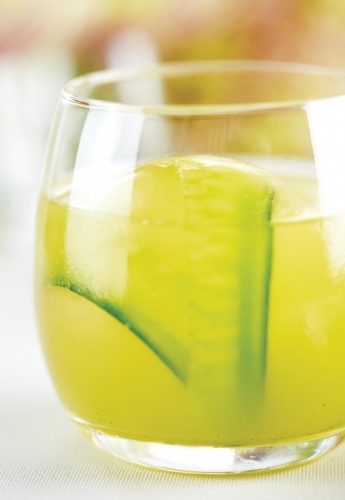 Now, blend your cucumber, ginger, lemongrass and honey with approximately 40ml of water until all ingredients have combined. Strain your mixture through a sieve. To build your drink, in a mixing glass, combine 60ml room temperature Dilmah Vivid Springtime Oolong with Ginger with 40ml of cucumber and ginger juice. Add a squeeze of fresh lime to balance the flavour. Strain over an ice ball and serve.